gorgeous insect! great shot an_fear_tor! We have some Cecropia moths that are similar and quite large around here. Really great picture!!! Very nice photos man, thanks for sharing!! Thanks Swede! It's one of the most common here. Thanks Doc, I was lucky I had my phone in my hand to get it! I know of Killeen, Co.Clare, but I haven't been there. And Killeen isn't a surname I've come across very often. However the place where my grandmother lives and my mum grew up is called Killeeneen, which when translated from Gaelic mean The church of Finín (Fineen). The strange thing about Ireland's place names are that if two places sharing the same name could have different meanings because of two reasons, the variance in how Gaelic was spoken across the island and because of how it was Anglicised later. Had a look into the name Killeen and it appears to be most common in the Province of Connaught, in the counties of Mayo and Galway. 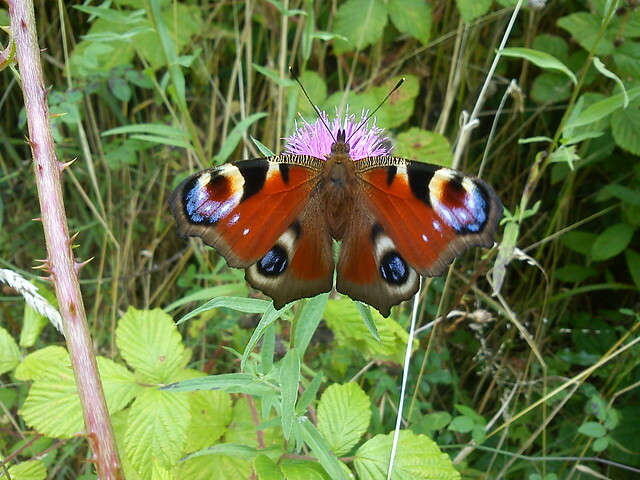 A Peacock Butterfly I spotted recently!